IT/Computer Maintanance - Responsible for the maintenance of the site. Mrs Kimberly Crowley - Editor for the articles to be included on the website. 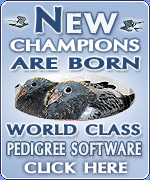 All views in articles included are done so by the writer and the content is not necessarily the view of the owner's of the Elimar Pigeon Services Ltd web site. Twitter, Instagram, Snapchat & Youtube. Click on each individual logo to be taken to our brand new pages or scan our Snapcode to add us.